Dimensions: 12'' X 5-1/4" X 8"
Durable 16 gauge (1/16)' steel painted hose holder with 11 gauge (1/8") bracket. 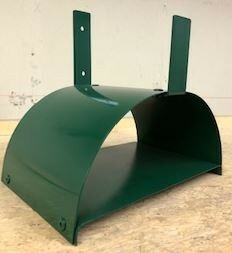 Product can be used to hold five (5) 50' standard garden hoses. It can also hold air hoses, ropes, and electrical cords. Comes with two (2) 1/2 x 2" exterior hex head screws for mounting. Also included are two (2) plastic anchors for mounting into masonry.